The primary challenge with gardening in the city is always a lack of space. 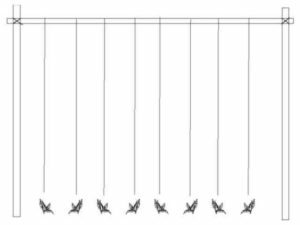 When it comes to growing peas, the best way to maximize your yields is to go vertical. Often times you can even plant something extra at the base with your peas. Most of these pea trellis ideas are incredibly easy to build and even someone that is DIY challenged can make these happen. A woven pea trellis is a great option for any garden space. 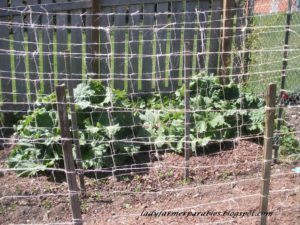 Even simpler than a woven trellis for peas is a basic frame and string trellis. Now it is more limited, you can’t lean it back for example, but by building a simple frame with uprights and a cross bar and dropping garden twine down to your pea plants, you can make a very effective trellis. 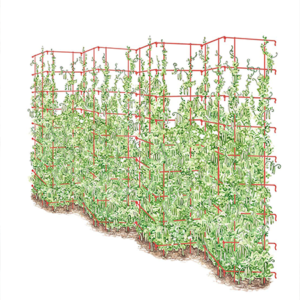 I have done this before and is actually one of my favorite ways to trellis tomatoes. The only risk with peas on this type of trellis is that if you live in a windy location, they can get knocked around a good bit, at least until they fill in. 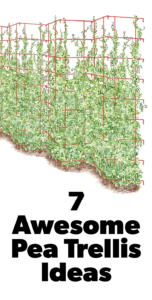 Splaying out your trellis gives your plants more room to grow and get light. One way to make sure you give your plants a lot of room is to splay out the top of your trellis. The plants won’t care as much if they are close together at the base, but opening them up at the top gives them more sunlight and air flow which is essential to having healthy plants. This isn’t much more difficult to build and is only slightly more complicated than the basic pea trellis. Another flexible way to trellis peas is to simply build a teepee out of sticks. 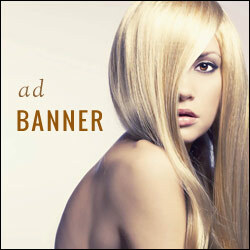 This can be as large or small as you desire. A big advantage to this sort of arrangement is that you can plant vegetables inside the teepee that prefer a little less sun and they will do well shade by the peas as they grow. This is really a variation on the three sisters idea where you plant corn, then as they grow, you plant beans and the beans use the corn stalks as a trellis. 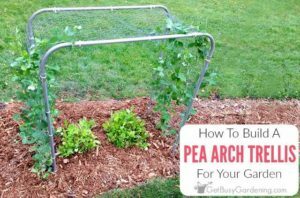 For a more permanent addition to your garden, you can build an arched trellis for your peas or other climbing plants out of electrical conduit and chicken wire. Depending on your space and creativity you could potentially make one tall enough to walk under. 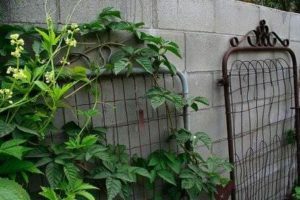 GetBusyGardening.com has a great tutorial on how to build a metal arched pea trellis. All of these trellises so far are more for function and less for aesthetics. 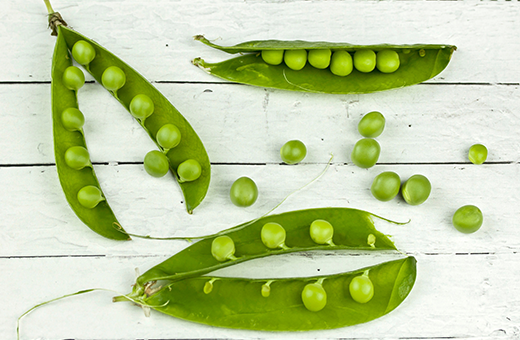 That being said, you can fire up the creativity when it comes to pea trellises. For example, in the photo above, they are using old gates as support for their plants. If you open your eyes and look around, you can probably find some cool looking and functional trellises. 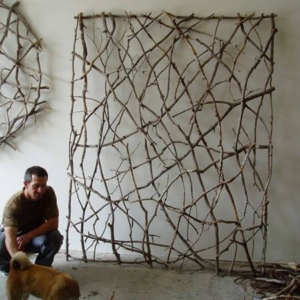 A very artistic trellis made out of sticks woven and tied together. Lastly, I don’t want to overlook purchased trellises. There are a wide variety, everything from small ones appropriate for containers to the large metal pea trellises like the one in the image above that is designed for a raised bed garden. 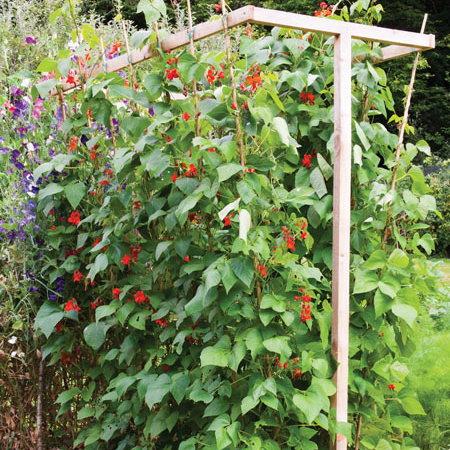 If you aren’t very handy or don’t have the tools to build your own trellises, don’t feel bad about purchasing a pre-build trellis for you peas to grow on.